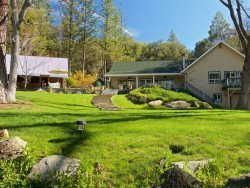 Yosemite-Sierra Foothills Retreat! Nestled quietly in the mountains of Ahwahnee outside of Yosemite National Park, this mountain getaway has all of today’s modern conveniences and amenities. The luxurious home features a spacious 4800 square feet, and sleeps up to 14, with five bedrooms and four bathrooms. Sitting on 10 secluded acres, this private residence makes an ideal location for family reunions, corporate retreats, romantic getaways, special events, and more. Impeccably decorated throughout, this home features a master suite downstairs and a second master suite upstairs. Some of the other many inside amenities include a fully-outfitted kitchen with 3 refrigerators, dishwasher, pantry, mudroom, sitting room, exercise room, office, library, game room, 5 televisions, DVD, Blue Ray, Wii, Direct TV, Internet, wood fireplace, washer/dryer, Outside amenities include a wrap-around porch, pool with slide, low spring board, heated spa, outdoor gas barbeque, herb garden, rose arbor, greenhouse, large trees for shade, and outdoor speakers for the pool area. The property is handicap accessible. No smoking. No pets. Available at a weekly rate year round. The Getwaway house was perfect for our needs in every respect. Well furnished in every respect and every cooking gadget you might want.